A team from London District are on island for a courtesy visit. 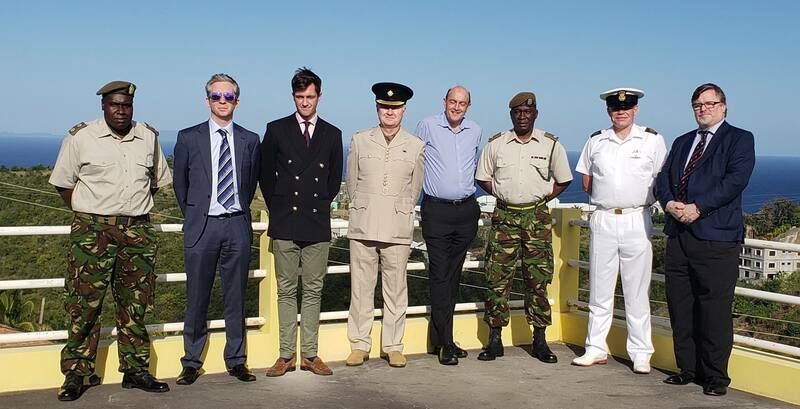 The Montserrat Royal Defence Force (RMDF) is currently hosting colleagues from the Irish Guards and the Ministry of Defence in London. The meeting is as a result of last year’s visit from the Minister of Armed Forces Mark Lancaster who instructed the Irish Guards to rekindle their bond of friendship with the defence force. Governor Andy Pearce hands over the new kit to RMDF Major Alvin Ryan on Monday Afternoon as Major Niall Hall of the Irish Guards looks on. Major Alvin Ryan, commander of the RMDF said Minister Lancaster had given his assurances that he would be doing more for the local regiment and he has kept his word. Officers have been given increased access to training to bring them in line with the British military standards. Minister Lancaster had also expressed dismay at the state of the local uniforms and instructed that they receive new kits as available in the UK. The Irish Guards have supplied 60 kits, comprising hat, boots, and uniform for use by the local force. Major Niall Hall said he was pleased to be able to rekindle a relationship which began in the 1980s but which fell apart during the early years of the volcanic crisis as priorities had shifted. He and his colleagues will be on island until Friday, February 1, 2019 to meet with officials and also review the various sections of the defence force, including the new marching band which was recently launched. Other members of the delegation are Captain Charlie Bell of the Irish Guards, Captain John Warburton, rifles staff officer in London District, Richard Holman, Internal Security Policy from the Ministry of Defence and John Matheson, CPO, Assistant to the Defence Advisor Caribbean. The RMDF commandant says they are currently recruiting for new members. Anyone interested can contact them at rmdf@gov.ms. Lt Glenrpy Foster shows off the new kits for the RMDF.